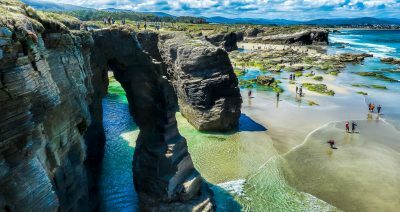 Northern Spain, or Green Spain, offers some of the most picturesque landscapes of the Iberian Peninsula. The topography ranges from lush green valleys to dramatic coastlines with steep mountain cliffs plunging into the sea. 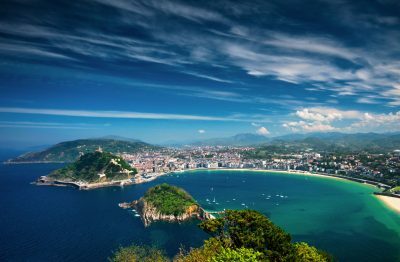 Colorful seaside towns dot the vast coastal area from Galicia east through Asturias and Cantabria to the Basque Country. Unique to the rest of Spain, these regions remained almost untouched by Moorish culture due to their remote location and climate allowing for long lasting cultural preservation. Its diversity is particularly evident with the Celtic sounds of Galicia’s bagpipes and their Gallego dialect. Our tour begins in Santiago de Compostela, the iconic finale to the famous Christian Way of St. James which is considered the third-most important pilgrimage site after Rome and Jerusalem. 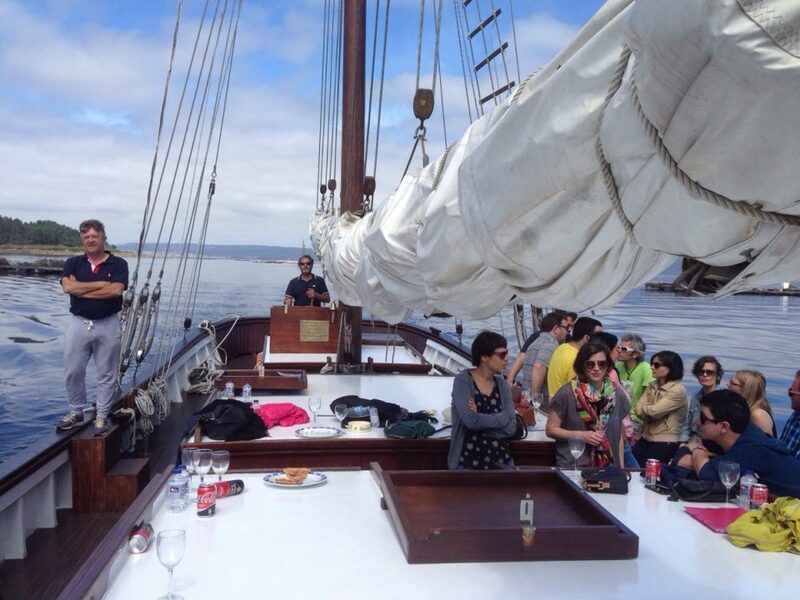 South of Santiago we’ll board a sailing vessel for a trip downriver and visit a fortified winery in Cambados. On the border between Galicia and Asturias we stop in the seaside town of Ribadeo where we’ll discover the many Indiano mansions. Oviedo offers itself as a cultural capital with Asturian cheese and cider houses. Cantabria is a lush, green coastal region with a mountainous backdrop and pretty seaside villages. Bilbao is certainly one of the planet’s loveliest towns and boasts two world class museums – the Guggenheim and the Bellas Artes. In La Rioja we’ll experience a day with Spain’s most noteworthy wines. Our trip finishes with two spectacular Basque beach towns – San Sebastian and Biarritz. Batu zaitez – come join us! 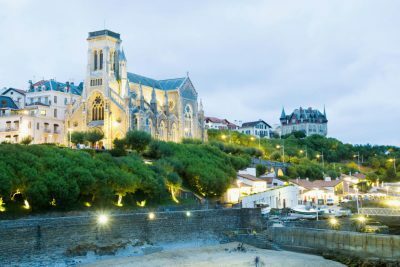 Our Northern Spain Small Group Tour begins with your arrival to Santiago airport, where you will be transferred to one of the most well-known Paradors in all of Spain, the former hospital of the pilgrims, El Parador de Santiago (3 nights). From the hotel balcony overlooking the famous Praza Obradoiro, you’ll witness pilgrims conclude their trek by touching the scallop shell commemorating the end of their journey. At 6:30 we meet in the cloister for a welcome drink and orientation meeting, followed by a short guided tour of the hotel where we will learn its rich history and experience a decadent introduction to Galician cuisine in the former hotel stables. This morning begins with an introduction to the history of Santiago in Obradorio Square followed by a journey through the maze-like stone paved streets of the casco antiguo. Visits include the University Fonseca and Santiago’s most important monument, the cathedral, where pilgrims perform the ritual of embracing the statue of St. James as they exit the tomb. Afternoon free. This evening’s included dinner will delight your senses with a creative Galician fusion tasting at a Michelin starred restaurant! Morning departure for a sailing trip on an historical schooner through the Ria Arousa Estuary. Mussels, tapas and on-board refreshments will accompany an explanation of Galicia’s importance to Spain’s seafood industry and mussel cultivation. Cambados, the center of Albariño wine production, is a delightful Galician town with granite homes, pleasant streets lined with shops, restaurants, bars and wine merchants. Located on the grand square is the 17th century fortified Palacio de Fefiñanes which has been producing wines since 1904. We’ll have a midday guided visit here followed by an ample tasting of their Albariño. Lunch on your own in Cambados. Late afternoon return to Santiago. Evening free. 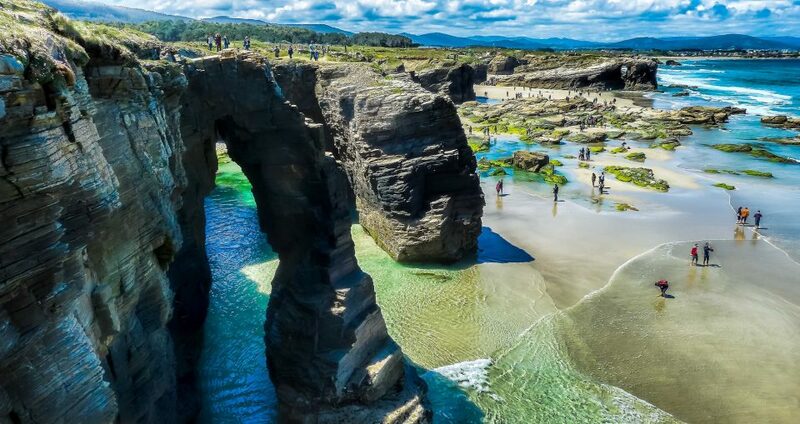 Ribadeo is best known for its picturesque La Pancha lighthouse and the Playa de las Catedrais, considered one of the most beautiful stretches of sand on the Galician coast. Our visit to the historical quarter includes the many colorful mansions built by Indianos, emigrants to the Americas who returned to Spain wealthy in the late 19th and 20th centuries. The notable Tower of Moreno was designed by a disciple of Antonio Gaudi, Argentine architect Julian Garcia Nuñez. Included lunch at a portside restaurant. Prior to arriving to Oviedo we’ll visit the pre Romanesque 9th century Santa Maria Naranco and San Miguel de Lillo churches, UNESCO World Heritage sites. Santa Maria was originally constructed in 848 as a recreational palace for the King of Asturias. Our lodging for the next two nights is the Baroque style Hotel De La Reconquista which has been hosting Asturian nobility and Spanish royals for over 500 years. Oviedo, given the role as the Principality of Asturias is the administrative, economic, and judicial center of the region and is also home to the region’s largest university. Each year the Princess of Asturias Foundation awards those in the fields of the sciences, technology, arts and letters. Oviedo is a town made for walking, being home to one of Spain’s first pedestrinization movements. In recovering the streets for its citizens and visitors, parking garages were placed underground and car access was forbidden inside the old walls. Oviedo’s successful transformation now serves as an example for cities aspiring to make similar changes in Spain. Our morning tour begins with a walk through the historic district where we can admire the influence of art noveau architecture and the over 130 statues placed throughout the city – a quirky artistic touch with characters from Spain’s literary past as well as those of modern figures. The 14th century Gothic cathedral, dedicated to San Salvador, is Oviedo’s most visited monument and especially significant for it’s well known Shroud of Oviedo. The morning concludes with an Asturian cheese tasting. Known as the land of the cheeses Asturias produces more than 100 varietals and is known throughout the world for this culinary wonder. Morning departure for the colorful Cantabrian Villages. Our first stop is Comillas. 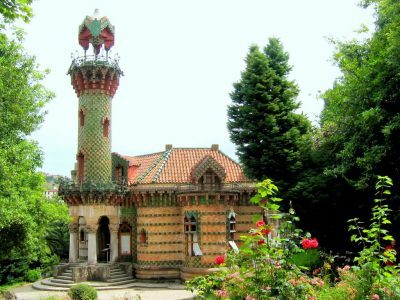 We’ll walk through the Plaza del Corro de Campios, the oldest part of town surrounded by ancestral mansions and have a guided tour of El Capricho, a 19th century Art Nouveau creation by well-known Catalan architect Antoni Gaudí, and one of only three of Gaudi’s designs found outside of Barcelona. Free time and lunch on your own. Often referred to as the “prettiest village in Spain” Santillana del Mar is a collection of 15th-17th century stone houses. 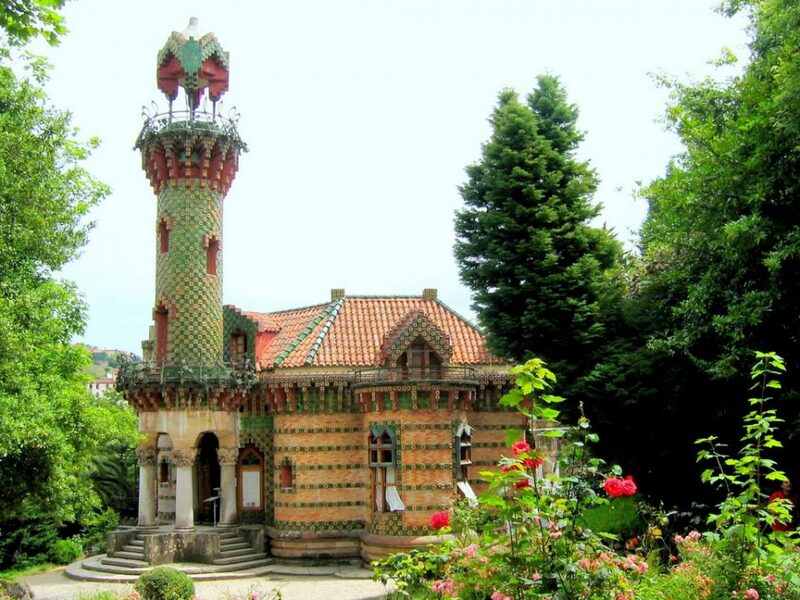 Situated on the Bay of Biscay and bordering France to the east, Spanish Basque country is divided into 3 provinces, Vizcaya, Alava, and Guipuzcoa. While the origins of the Basque people are unknown, they are considered the oldest pre-indo European ethnic group on the Iberian Peninsula. Their remote mountain location allowed for its inhabitants to preserve their native language Euskera and other distinct traditions for centuries up until present times. The morning tour begins just in front of the hotel where we can observe what some now refer to as the Bilbao effect. 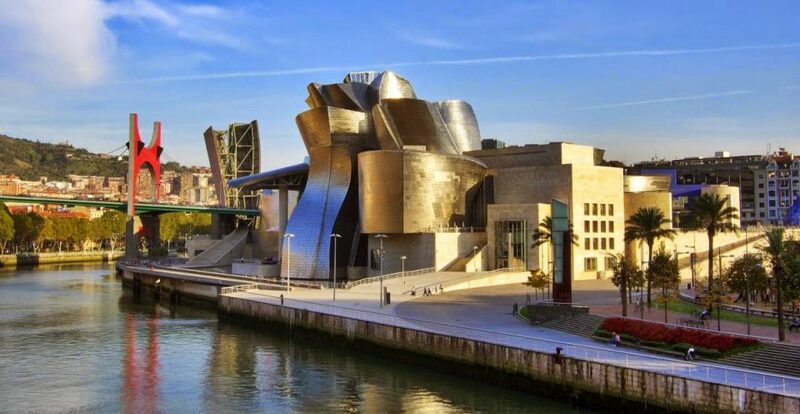 A term coined to describe the transformation of Bilbao’s depressing industrial port into an inviting green space with one major attraction, Frank Gehry’s Guggenheim Museum. While the museum’s contents and collections are of importance, more noticeable is the exterior with its giant mirrored steel space ship like twists and turns. The museum has promoted a buzz of activity where outdoor cafes decorate the sidewalks, musicians perform and pedestrians stroll along the footpaths. Stepping away from modernism we go back in time with a visit to the Casco Viejo, the old quarter situated on the right bank of the river and the 19th century boulevards of the Ensanche, Bilbao’s business district situated on the left bank. Afternoon visit to the Guggenheim. Evening dinner included. Guernica was the inspiration for Pablo Picassos’ most well known painting depicting the horrific turn of events on Monday April 26, 1937 when German and Italian war planes bombed a farmers market killing hundreds. Hilter wanted to experiment with a new war strategy and was given the opportunity when Franco, frustrated by the Basque resistance, allowed the bombing as a test run. The short stop consists of a visit to the Basque General Assembly House. Bermeo is one of the most important fishing villages on the Basque coastline. It features an old port, colorful homes and a lovely park surrounded by bars and restaurants. Inside the medieval Ercilla Tower is housed the wonderful multi-media Fishermen Museum where we spend part of our morning. The museum details the work, customs and lifestyle of the fishermen and their families, their fishing techniques, how they constructed their boats and made their nets. San Juan de Gaztelugatxe is a picturesque small island on the Bay of Biscay that is connected to the mainland by a stone bridge and 241 steps that we are not going to climb. On the island is a church that was originally built in the 9th or 10th centuries. We’ll have lunch at a great restaurant overlooking the island. Late afternoon visit to the not-to-be-missed Bellas Artes Museum in Bilbao, featuring works by Goya, El Greco and Gauguin. This morning we embark on an adventure into La Rioja, Spain’s most acclaimed wine region. 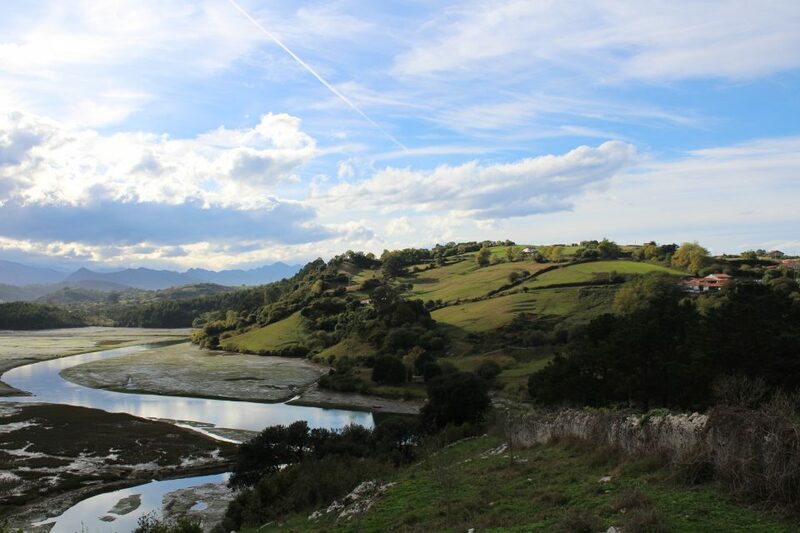 Situated along the Ebro River and protected from the elements by the Cantabrian mountains, the clay and limestone soil has produced vineyards that have thrived here since Roman times. The most common grape varietal is the tempranillo and the garnacha. Rioja wines can be red, white, rose and are classified as Riojas, Crianza, Reserva and Gran Reserva depending on their age. The Vivanco Wine Museum– An introduction to La Rioja begins this morning with a stop at this world famous museum. A 4,000 square meters facility dedicated to the 8,000 year relationship between man and wine. Travel through time following the history of wine production through this interactive museum and finish off the visit with a glass of Tempranillo. LaGuardia is perhaps the most attractive village in La Rioja. It’s name, meaning “the guard”, came about for its promontory location in watching for potential invaders from the North. 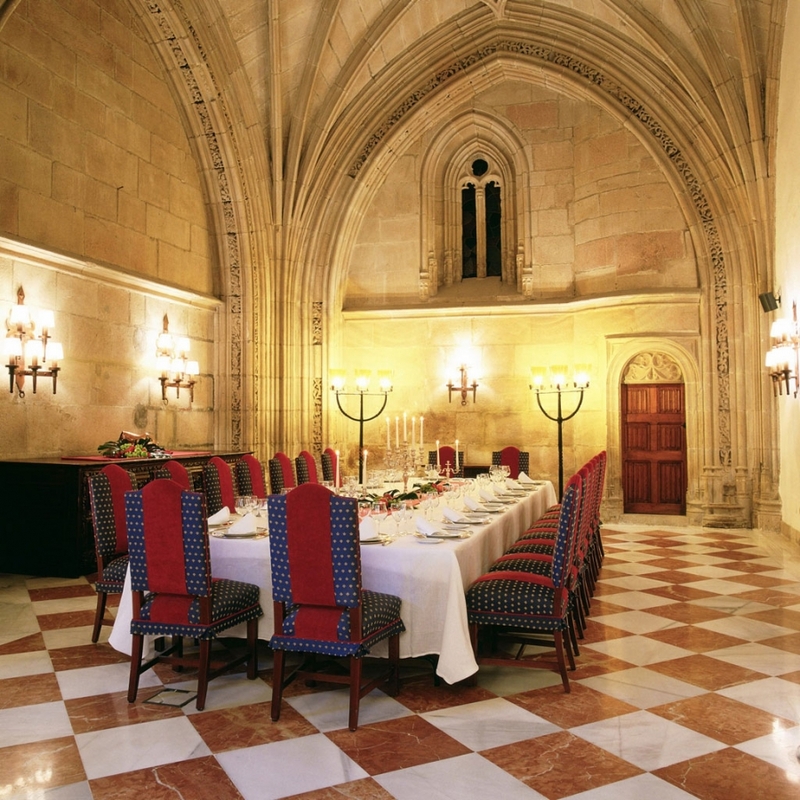 We’ll stop in a 17th century palace for a tour of their wine cellar, an exquisite tasting and lunch. Then a short walk following the walls of the 8th century village for a photo op of the Ebro river and surrounding vineyards. Afternoon arrival to the luxury Hotel Maria Cristina in San Sebastian. (3 nights). Dinner on your own. We recommend one of the many Michelin-starred restaurants or, more simply, an evening of pintxos in the old town. 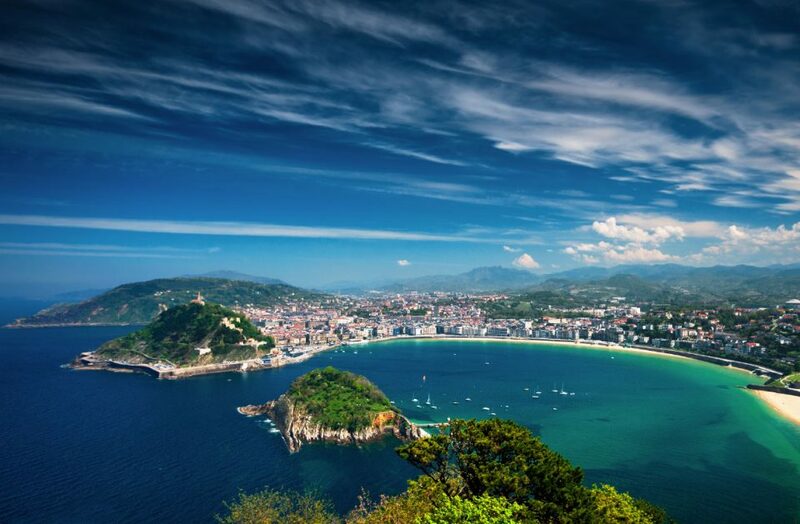 San Sebastian, called Donastia in Euskera has been the long time favorite vacation spot for Spanish Royalty. The city gained its notoriety in the 17th century when doctors thought the salt sea waters would help cure Queen Isabel II from a skin ailment and she began making frequent visits to the city. Now it is a lively resort town scattered with pintxo bars and swanky hotels. The city is divided into four districts or “barrios” and each district has its own personality. Our morning guided tour takes us through the Area Romantica, the commercial and shopping district with its elegant 19th century architecture and La Parte Vieja, the old fishing village. Two important churches are found within the old town, the Church of Santa Maria and the Church of San Vicente, the oldest building in San Sebastian. Afternoon on your own to enjoy the 1.5 kilometer Concha Beach and walk to the Comb of the Wind, the iron sculptures located at the end of Santa Clara Beach. Pintxos are the Basque version of tapas, only better. 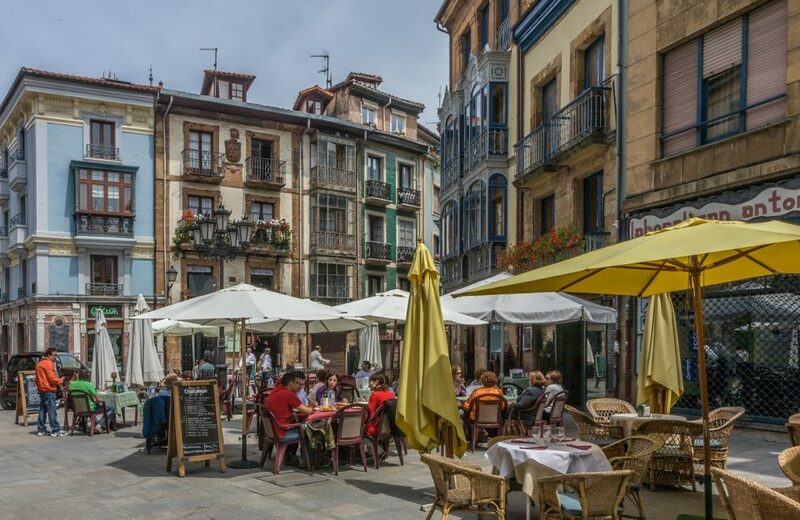 Evening free to participate in local culture by visiting the old town packed with bars serving the most abundant collection of delicious pintxos in all of Basque Country! The final excursion of our tour takes us across the French border to Biarritz, famous as an elegant 19th century beach resort for European and Russian nobility. Sporting 6 km of sandy beaches, in recent times, it has been home to Europe’s best surfing. Today it is a delightful mix of grand houses, palatial structures – notably the Hotel du Palais and the Casino Municipal – and a relaxed surf scene. A stroll through the old port, where whaling ships once docked, and down the Rue du Port-Vieux will lead to restaurants, bars and shops. All breakfasts, 5 dinners and 2 lunches. Beverages included. Purchase a multi-city ticket into Santiago de Compostela SCQ and out from San Sebastián EAS airport. Transfers from the Santiago de Compostela Airport to El Parador Hotel are included. 05:30, 07:50 and 11:30 maxi van transfers to San Sebastian airport. Trip takes 30 minutes. Transfers to Bilbao airport on request (€100 supplement required). Trip takes 80 minutes. There is a lot of walking on this tour and you will be on your feet several hours each day. This tour is not suited for anyone who has problems with knees, back, heart, obesity or those who cannot manage steps and moderate inclines. Age is not important as long as you are reasonably fit and a good walker. If you have mobility issues this is not the right tour for you. Please call us if you have questions. Transfers from Santiago de Compostela Airport to El Parador de Santiago hotel..
All ground transportation Days 2-11. Morning transfers on Day 12 to San Sebastian and Bilbao airports at scheduled times. 11 nights’ hotel accommodation with breakfast. 5 dinners and 3 lunches including beverages (wine or beer or soft drinks and water). Admissions to all sites visited as a group, as listed in bold on the tour itinerary. 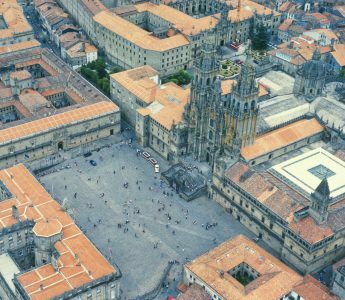 If you are visiting Spain only for the 13 days of our tour you will want to purchase a multi-city flight into Santiago de Compostela and out from San Sebastian or Bilbao. Transfers will be scheduled after we receive the arrival times of all the tour participants. Your tour manager will be expecting you in the hotel lobby for a welcome meeting at 6:30pm prior to our welcome dinner. Morning transfers to San Sebastian and Bilbao airports at scheduled times. Are located in quiet locations within historic districts. European hotel rooms are generally smaller than those in the U.S., and have one queen/king bed or two twin beds, with private bath. We have space available for two or three singles on each of our tours. They are provided with single-use double rooms. The additional single supplement cost is 1100 euro. Please contact us for availability prior to booking. Package tour prices, as listed on our web site, are guaranteed. We do not sell optional excursions or take you on shopping expeditions. Your additional expenses will be for non-included meals, moderate tipping where appropriate, and personal sightseeing or shopping. For the enjoyment of all our guests on tour we ask those who choose to travel with Amber Road Tours to be congenial, lighthearted and to take small issues in stride. Should you have any issues please address them to your tour manager – he or she is your Amber Road Tours’ representative during your time on tour. Once your tour is finished you will be emailed a link to our website where you can leave comments about your experiences and suggestions about how we can improve our services.